A High Court in Owerri, the Imo State Capital, has stopped the swearing-in of Mr Calistus Ekenze as the new Deputy Governor of the state. 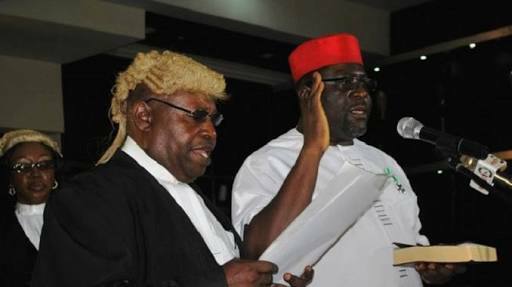 The court issued an interim order stopping the swearing-in ceremony after it was approached by Eze Madumere who is challenging his impeachment as deputy governor of the state. The ruling came just as Ekenze was about to be sworn in. Top government officials had started gathering at the Sam Mbakwe Exco Chambers inside the Government House in Owerri where the swearing-in was supposed to take place as early as 10 am. But just after waiting for over two hours for the commencement of the ceremony, the Imo State Attorney-General and Commissioner for justice, Miletus Nlemadim, announced that the state government had complied with a fresh order from the court preventing the Chief Judge of the state, Pascal Nnadi, from swearing-in Mr Ekenze. According to the Attorney-General, the state government is law-abiding and respects the rule of law and as such obeyed the court order. He, however, explained that the state government is doing everything possible to vacate the order to enable it to swear in the deputy governor designate on a future date. Recalled that Governor Okorcha had nominated Ekenze as deputy governor after the impeachment of Eze Madumere yesterday, while the matter was still in court.